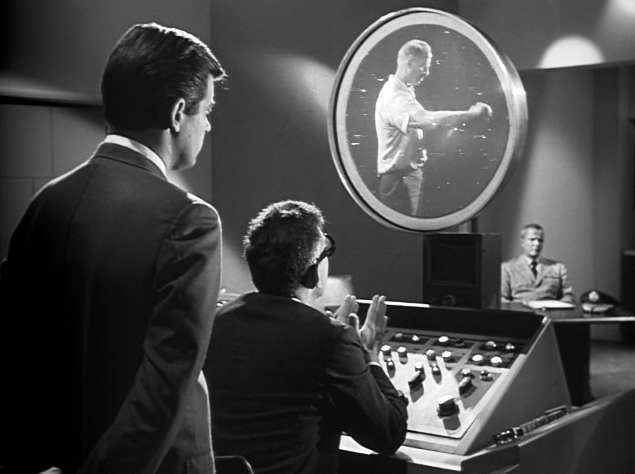 John Kenneth Muir's Reflections on Cult Movies and Classic TV: The Outer Limits: "OBIT"
In “O.B.I.T,” which first aired on November 4, 1963, Senator Orville (Peter Breck) opens an official inquiry at Cypress Hills Defense Installation regarding the murder of a technician at the facility. 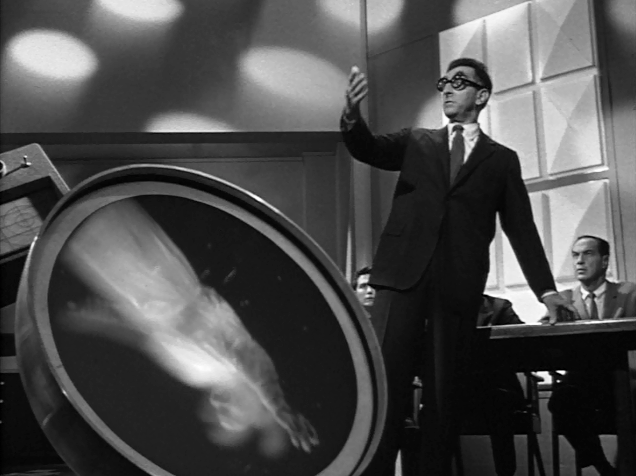 Although obstructed by the bureaucratic administrator Byron Lomax (Jeff Corey) at every turn, the Senator soon learns that the technician’s death occurred while he was operating a top-secret machine called O.B.I.T. (Outer Band Individuated Tele-tracer) which could spy on any individual anywhere within the facility…or even a 500 mile radius. The Senator seeks to learn more about the unusual device and its use by Lomax. He fears that, among other things, O.B.I.T. -- a so-called “Peeping Tom Machine” -- represents “an end of privacy” for Americans, and the beginning of a constant surveillance state. For expressing these viewpoints, the Senator is accused of “undermining” national security by the Pentagon, which sponsors Cypress Hills’ research. In the end, Orville’s murder inquiry leads to Lomax, the one individual whom O.B.I.T. cannot seem to spy upon. When Lomax’s image is finally projected on the O.B.I.T. viewing screen, the frightening truth behind the surveillance machine is revealed at last. 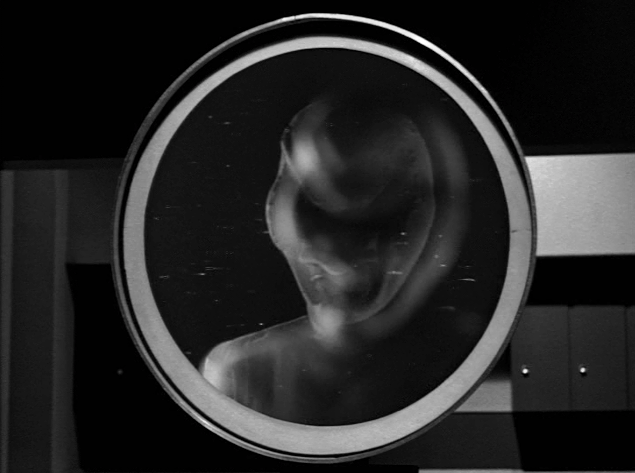 With surprising accuracy, this episode of The Outer Limits (1963 – 1965) predicts the surveillance state in the United States of America, circa 2014. Specifically, “O.B.I.T.” showcases Defense Department employees “spying” on other employees, and even their own family members. With revelations this week that the NSA may actually be spying on members of Congress, “O.B.I.T.” seems downright prophetic in its social critique. 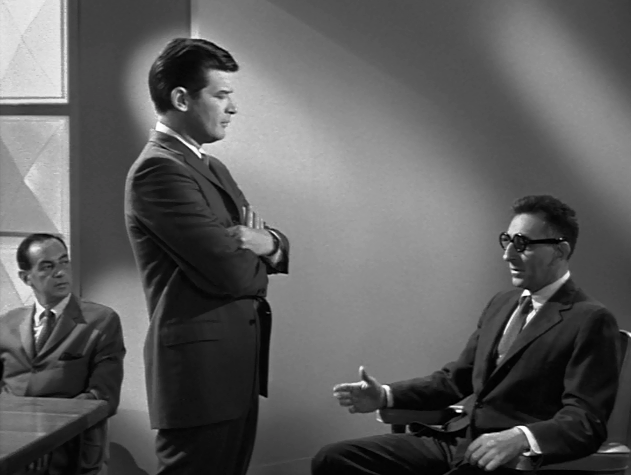 And, in the way only art can accomplish, this Outer Limits episode explains why spying on a free citizenry is never a good thing. In other words, the O.B.I.T. machine (and the capacity to read private e-mails and listen to private phone calls) activates and encourages some universal sense of voyeurism in people; something that even the best of us can’t always resist. The first season of the hit series Homeland stresses this idea as well. In that program, an intelligence officer played by Claire Danes watches -- around the clock -- the life of a returning veteran and his family, and then falls in love with the subject of her constant surveillance. A false sense that she “knows” him is created…a false feeling of intimacy. This voyeurism is what O.B.I.T. terms “the most mortal weakness:” our capacity to watch (and judge) others while we reserve “privacy” for ourselves. Secondly, “O.B.I.T.” diagrams how constant surveillance can have a stifling impact on art, on work, and on simple human interactions because everyone is terrified to be “seen” or “heard” even in what they would rightly assume are their most personal moments. No doubt that’s true. But in the end, who among us can stand up to the scrutiny of 24-hour surveillance? Once a person’s every thought and private action is known, down to the last, most minute degree, how are we to know that even the best of us wouldn’t be then considered an “undesirable” element by the voyeurs? By what standard of perfection do the voyeurs judge those whom they observe? It’s accurate to say, of course, that we have no O.B.I.T. machines today, but the debate about our government’s right to read our e-mails and listen to our calls continues, and this episode, by Meyer Dolinsky imagines where the spying could possibly lead: to a world in which “acts of private passion” could be used to blackmail members of Congress, the media, or our families. I love that the name of the device is OBIT, because what this episode discusses is the very death of freedom in America that comes inevitably with “the end of privacy.” OBIT equates to the obituary of liberty. Before anyone suggests I’m climbing on a political soap box here, I should note that I am one of those people who frets as much about business interests getting an O.B.I.T. device as I do about the government having one. Here’s an example from my own life. Back in August of 2013, a railroad tie retaining wall I was standing on collapsed beneath me, and I fell six or seven feet…and landed on my head…on concrete. I felt very dizzy, and looked up “concussion” on Google. I later drove myself to the Emergency Room (apparently a no-no with concussion…) and was diagnosed indeed with a concussion. While I was sitting waiting for my CT scan and neck x-rays, I happened to check my phone. I had a new e-mail from a law firm asking me if I had “recently” suffered a neck injury. At least in the case of government, there are some good people -- conservatives and liberals both -- acting for legitimate causes to prevent future terrorist attacks. But why, precisely, do commercial interests have any right to know my personal business? So the modern “surveillance” state is as much about out-of-control capitalism as it is national security, in my opinion, and that’s one element of the landscape that “O.B.I.T.,” made in the 1960s, didn't foresee. 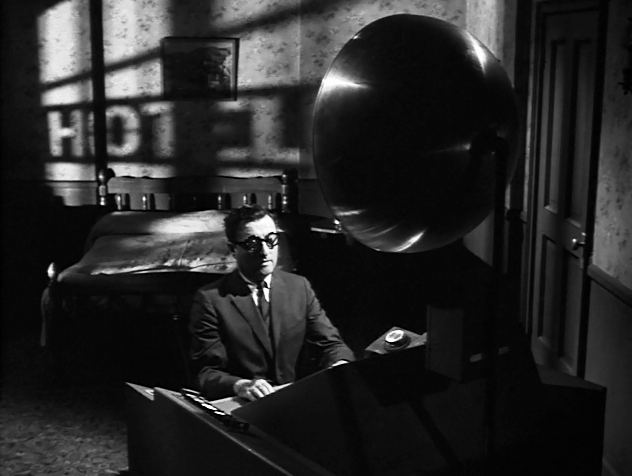 At another juncture, the episode cuts to Lomax during the inquiry. 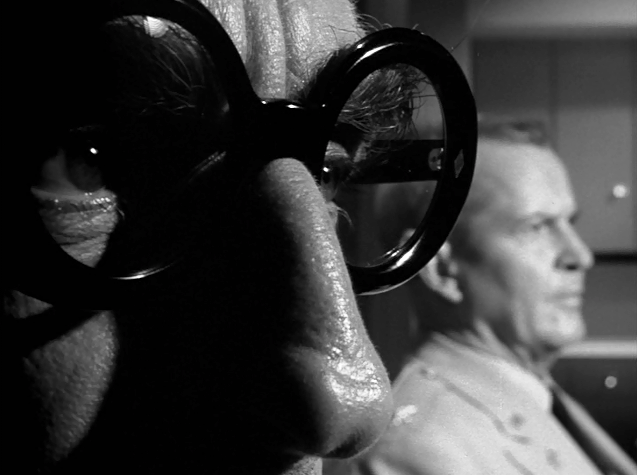 We are treated to an extreme close-up of his eyes and spectacles, or eye-glasses. This choice of imagery accents the importance of “sight” and “seeing” to Lomax, and the circular spectacles mirror, in some crucial fashion, the circular O.B.I.T. screen. The Outer Limits was always a series about man confronting his inner demons on the technological cutting edge, and “O.B.I.T.” is no exception. “I saw a monster!” one character notes during the narrative. That monster, we find out here, is not merely an alien spying on the human race, but our very human propensity to invade the privacy of others and attach judgments to what we see. "It’s the most hideous creation ever conceived,” one Cypress Hills employee observes in the episode. “No one can laugh or joke. It saps the very spirit.”"
Sounds more to me like the stifling climate of political correctness we now live in. Or perhaps I should say we are ceasing to live because of.